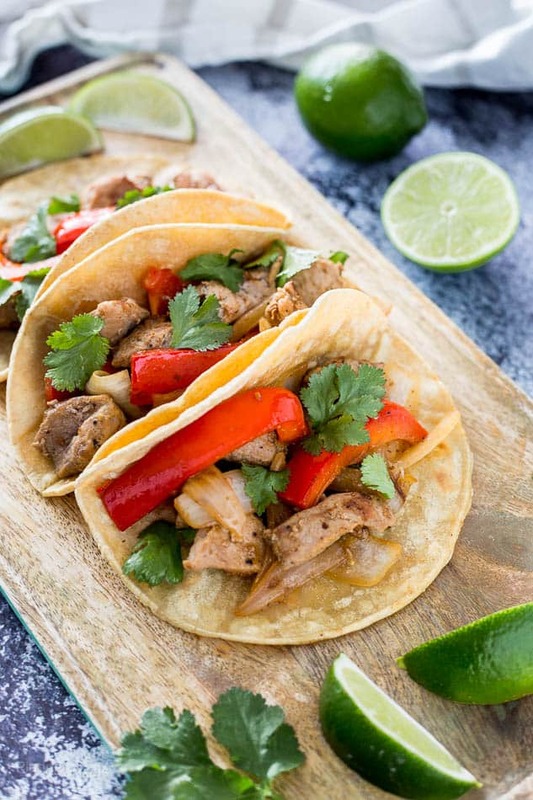 Homemade Easy Pork Fajita Tacos made into a quick and easy weeknight meal. Marinated pork tenderloin, garlic, onion, bell pepper, lime and cilantro loaded into corn tortillas. 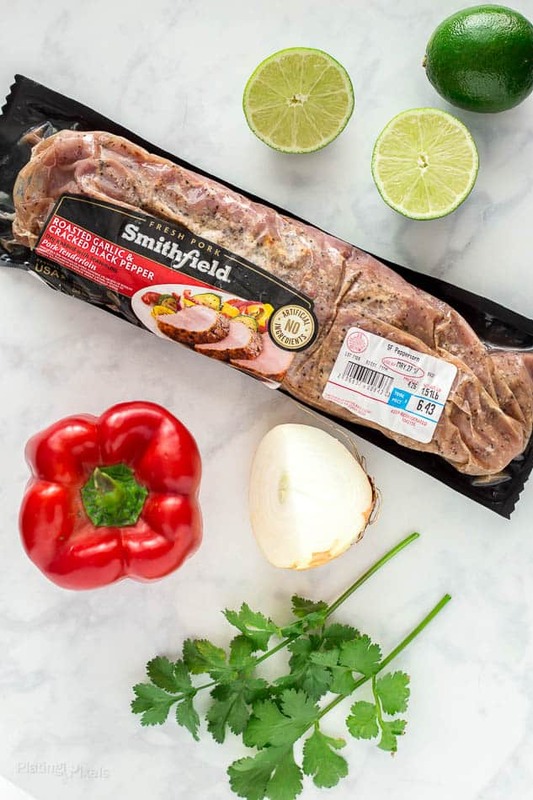 Sponsored post written by me on behalf of Smithfield Marinated Fresh Pork. The opinions and text are all mine. The recent Cinco de Mayo holiday, which also happens to be my birthday, only confirms my love of Mexican food. It’s a nice excuse to enjoy this cuisine as much as possible. 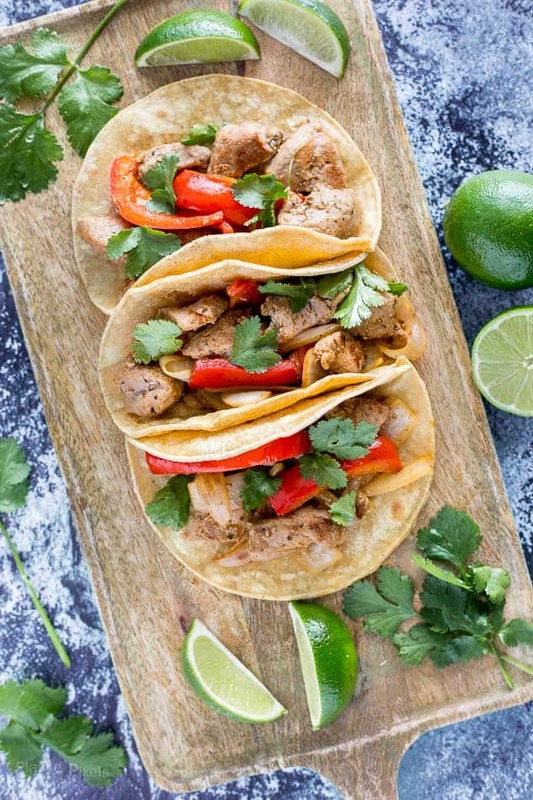 For those times when I want to cook at home, recipes like these Easy Pork Fajita Tacos are perfect for a busy weeknight or summertime meal. It’s a recipe that only requires a handful of ingredients, little prep and one pan. Now that’s my kind of meal. Fajitas specifically have always been a favorite, but the traditional way requires planning ahead, and extra marinating time. When you want a meal fast, sometimes you can’t wait hours, or even overnight for the flavors to infuse. These Easy Pork Fajita Tacos use a simple trick to skip the marinating, yet still has that authentic fajita flavor. 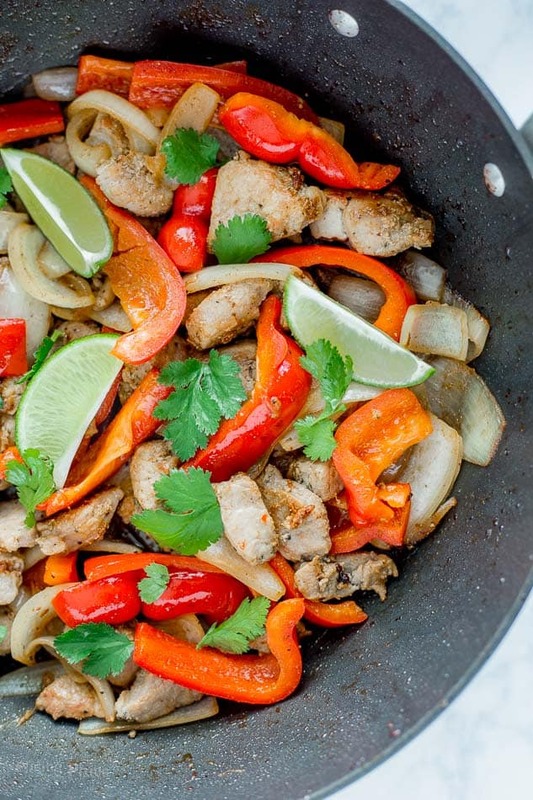 The key ingredients are all here as well—lime, bell pepper, onion, chili powder and cumin. Pork tenderloin is best for fajitas due to the tender, juicy flavor. The trick is to add the ingredients during or right after cooking. Start with the pork. That’s right, fajitas aren’t only made with chicken, steak or shrimp. You’ll be pleasantly surprised by the tender flavor of pork tenderloin in fajitas. For extra flavor and even more time savings I used Smithfield Marinated Fresh Pork Tenderloin. It’s conveniently pre-marinated to provide real flavor, real fast. The Roasted Garlic & Cracked Black Peppercorn flavor works perfectly for this recipe. 100% fresh pork with no artificial ingredient is something you and your family can feel good about. A tip for this fajitas recipe is to cut the tenderloin into small cubes, allowing it to cook in less than 10 minutes. Sauté on medium-high heat to quickly finish, while browning at the same time. Once the pork is cooked, just add bit of lime juice. It wouldn’t be fajitas without bell pepper and onion. Sauté them separately in the same pan. An added bonus is the flavor bits from the pork infuse into the vegetables. 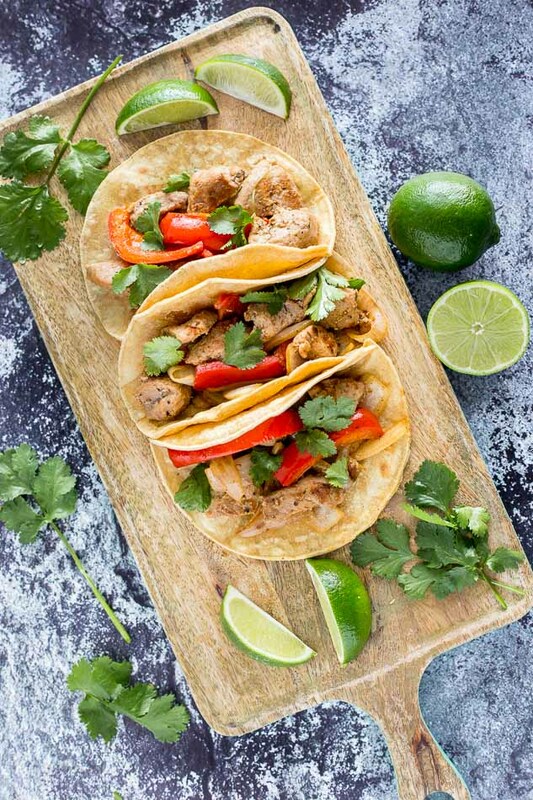 While cooking, add cumin and chili powder, then finish off with fresh squeezed lime juice to create your pork fajitas masterpiece. How long do you need to marinate fajitas? Typically you should marinate fajita meat at least 30 minutes, but 2 to 4 hours is best for flavor. 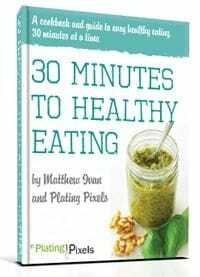 With these few tips, you’ll skip the lengthy marinating time, all while having authentic tasting pork fajitas in less than 30 minutes. Serve over freshly warmed corn tortillas and garnish with fresh cilantro, avocado and/or sour cream for any easy family meal. Marinated pork tenderloin, garlic, onion, bell pepper, lime and cilantro loaded into corn tortillas. Cut pork tenderloin into ¾-inch cubes. Heat 1-tablespoon olive oil to medium-high heat in a large non-stick pan. Add pork and sauté until browned and internal temp reaches at least 145 F, about 10 minutes. Stir in juice of one lime and remove pork from pan. Heat remaining olive oil in pan, add bell pepper and onion. Stir in cumin and chili powder. Sauté just until tender, about 5 minutes. Stir in juice of remaining lime and cooked pork. Remove from heat. Toast tortillas if desired, top each with pork fajita mixture and garnish with cilantro. I love the flavors of this pork recipe! I definitely need to try this one. Happy belated birthday! I would eat fajitas for my birthday as well. Love the fact that these are flavorful, yet quick! Love that these tacos are so easy and quick to make. They look super delicious too! One pan meals are always a winner – and meals with Mexican flair can never be beat! I’ll have to be on the look out for that pork, it sounds great. I am totally drooling over this recipe and I am dying to try it! I am having some serious dinner envy right now! Thank you for sharing! Can I get one of those tacos,? please!